We Love. We Dream. We Do. Students are given real world opportunities to apply knowledge and fulfill their greatest potential. Those who use the school are empowered with responsibility to create the world for themselves. 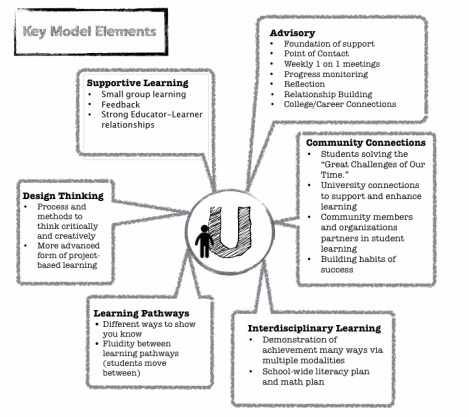 The U School readies ALL young people for college and careers by supporting students to accept challenges and opportunities through: student agency, real-world problem-solving, developing engaging high-quality products with the purpose of demonstrating mastery , and to push the boundaries of seat time through asynchronous learning. The U School commits to making the core processes as legible as possible for all users. Below you will see a visualization of the alignment of values, the design process, skills and ideas about what that might look like. Youth development focus: all students will join an advisory team (called Posse) with peers and a mentor educator who will design and create a vibrant high school experience; Posse will support goal-setting, college and career planning, and strong engagement with families to support learner growth. Personalized learning: every learner is supported in developing a personalized learning plan (PLP) and designing their learning pathway so that it reflects learner interests, needs, and aspirations. 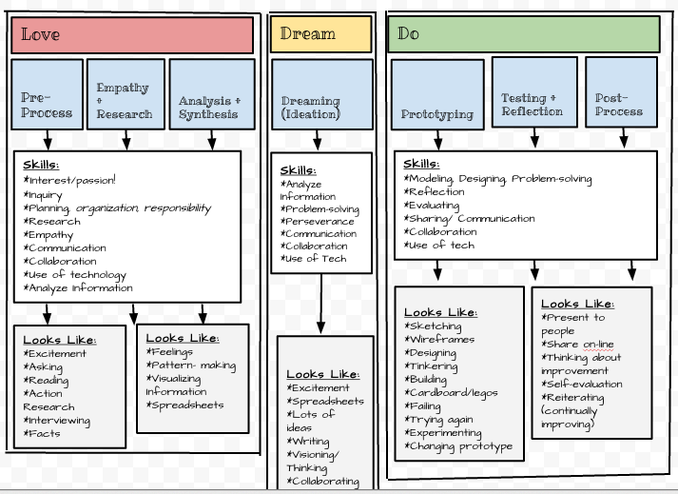 Competency-based education: learning goals are organized as "competencies" - the knowledge and skills learners must successfully apply in order to solve real world problems. Learners only advance once they have demonstrated proficiency of the learning goals. Design-based learning: learners lead personal and team-based investigations around the "Great Challenges of Our Time," and develop key skills in research, problem-solving, communications, and taking action.